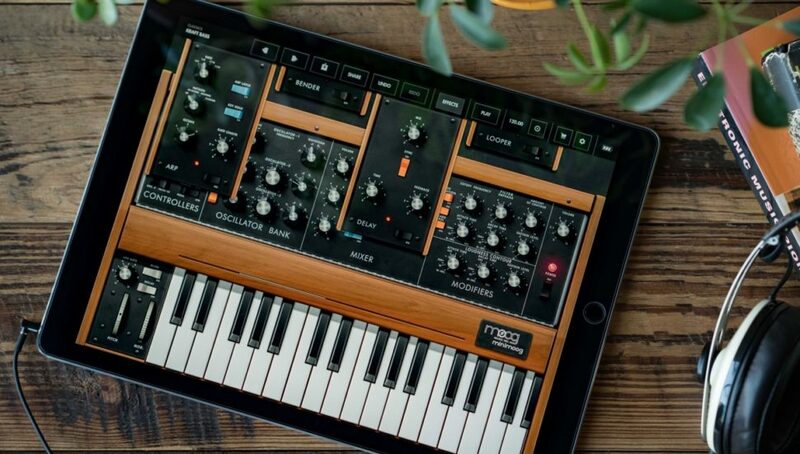 Moog’s classic synthesizer is now an official iPhone and iPad app with new features like polyphony, preset browser and looper. Almost 50 years have passed since Moog released the first Minimoog Model D, but the iconic analog synth is still as coveted now as it was when it launched. Although Moog released an official reissue in 2016, most people’s experience of the instrument will be via one of the many unofficial clones and software emulations on the market such as Arturia’s Mini V, NI’s Monark or the controversial Behringer D. As of today however, musicians looking for the Model D sound that don’t have $3,499 to spend on an official reissue have been offered what could be the most accurate emulation of the synth yet – Moog’s new $4.99 Model D app for iOS. 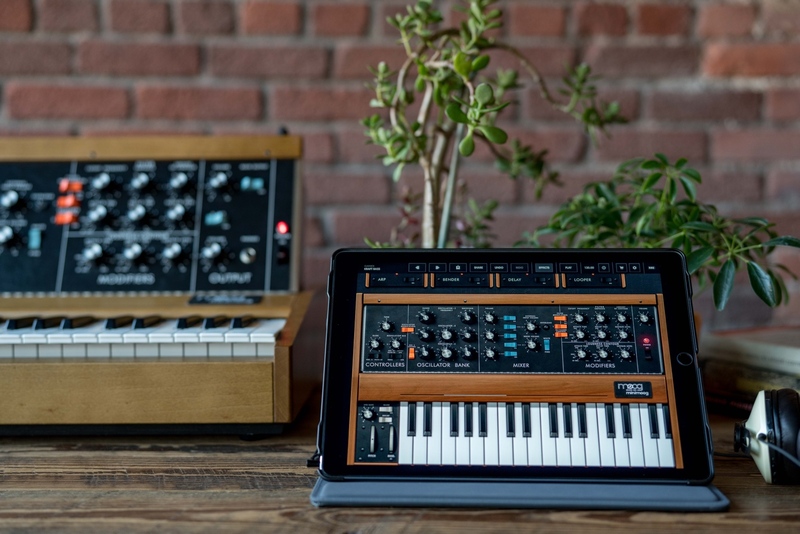 The app – which runs on both iPad and iPhone – is the latest in a growing line of iOS apps from Moog, which started with the Filtatron filter app in 2010 and two years ago added an accurate recreation of the Model 15 modular synth. Moog’s Model D for iOS also looks and sounds very faithful to the original and packs in a lot of the features you’d expect from software, such as a preset browser and AUv3 Audio Unit support for using it with the GarageBand app alongside features not found on the original, including arpeggiator, loop recorder and ping pong delay. Visually at least, Moog’s software team has managed to get the look and feel of the app just right. Even on a small iPhone screen it’s easy to switch between views to tweak the oscillators without having to squint too much or play the keyboard and push the modulation wheel. The new effects modules are also integrated in a way that faithfully retains the original look, popping out from tabs at the top of the screen. To my ears, the sound is also very good; it’s quite the same as an original hardware Model D, but it’s incredibly good for a $4.99 app. As Bevin explains, the team achieved this largely by trusting the ears of Moog’s employees. “We have the privilege of having many experts and great ears for analog that are very well versed in the vocabulary of analog synthesizers at Moog – particularly the Model D,” Bevin explains. 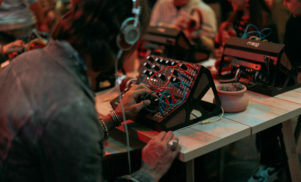 “People that have heard all various incarnations of that synthesizer, old and new, serviced and unserviced. So the first thing that we do is to get a sound that we think would theoretically be close and then do a whole lot of listening. 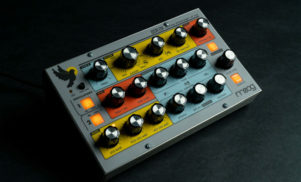 Of course, this isn’t a like for like recreation of the Model D – as well as an arpeggiator, looper and delay, the instrument has four-voice polyphony and a module called the Bender, which Bevin describes as giving synth patches “an almost orchestral sound”. The app also has different envelope modes; as well as a classic envelope mode that assists in making the snappy bass sounds the Minimoog is famous for, there’s a “clean” envelope mode that’s better for making smooth pads with the new polyphonic mode. Though not exactly true to the original, these additions were welcomed by the company. “Any idea anyone has is usually welcomed by everyone and we discuss if it’s appropriate for that product,” Bevin says of the collaborative process at Moog. While you’ll need a 64-bit device to make use of the Model D app, it’s compatible with all iPhones from the 5S upwards and all iPads from the Air and Mini 2. It’s available from the App Store now for an introductory price of $4.99.